Scale-Tronix 4002 is the only state-of-the-art infant scale designed to fit all popular incubators and radiant warmers. The 4002 employs a new computer-enhanced digital readout that displays step-by-step instructions. The scale cycles automatically through the weighing process, leaving the nurse free to attend to the patient. Current weight, previous weight and time lapse since last weighing are all displayed automatically. Shortly after completion of weighing, current weight is stored in memory as previous weight. The 4002 can be custom-programmed on site to offer an alphanumeric display in English, Spanish, French or German as well as accuracy of 1 gram, 5 grams or 10 grams. The program can be altered to provide only those options you wish, and in the sequence you favor. Another exclusive feature allows reweighing without disturbing the infant. The advanced digital readout also includes a screen-saver display. An optional RS 232 data port allows connection to a computer, remote printer or central station. 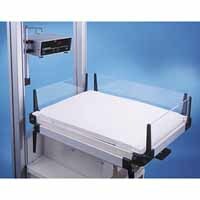 Our unique 1" high, open weighing frame allows x-rays to be taken without moving the scale or patient. And weâ€™ve designed a shock-absorbing system into the unit to prevent jolts and excessive weight from affecting accuracy and reliability. Universal weighing frame fits both incubators and warmers. Weigh or x-ray without disturbing the infant. Programmable Language - English, Spanish, French, German. Programmable Accuracy - 1 gm, 5 gm, 10 gm, 1/10 oz. Programmable Sequencing - The order in which the readout displays information. Readout - Alphanumeric, multi-lingual digital display in kilograms, grams, pounds, ounces, 1/10 ounces. Power Source - 110 VAC, line cord (220V optional). Reweigh: Recomputes weight while patient is on scale. Weighing Frame - 13 1/2" X 24" X 1". May be x-rayed through. Weighing Tray and Mattress - Specify manufacturer and model of warmer or incubator. Computer Capability - RS 232 output (optional). CE listed in conformance with Council Directive 89/336 EEC.